Hundreds of people come out each year to enjoy a homemade Thanksgiving meal at Point Pleasant Presbyterian Church. POINT PLEASANT — The season of giving has begun, and a local church will provide a homemade Thanksgiving dinner to hundreds of individuals from all walks of life next week. 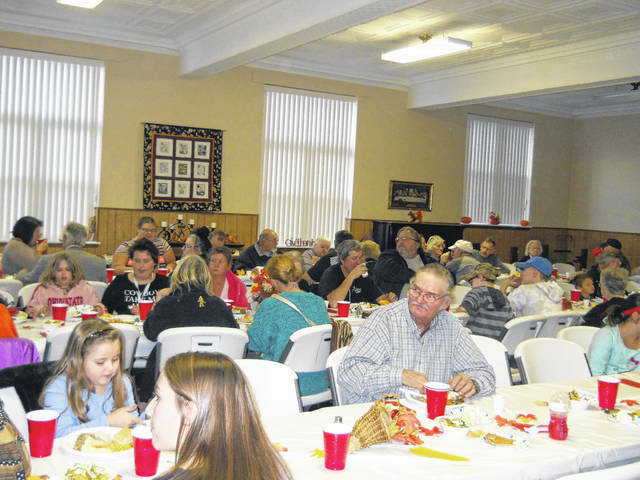 The annual Community Thanksgiving Dinner at the Point Pleasant Presbyterian Church is set for Tuesday, Nov. 20 from 4-6 p.m. The dinner is free and everyone is welcome to attend. For those who arrive early, they may meet in the worship hall where they can partake in a hymnal sing. Also, when children leave the dinner, they will be given a bag filled with various food items. Donna Lambert, church volunteer, shared throughout the day each year around 30-50 volunteers show up to help. Some of these folks are of the congregation, some are local FFA students and Boy Scouts, and some are simply members of the community who want to show their support for this event. The dinner will include turkey, stuffing, dressing, green beans, mashed potatoes, gravy, cranberry salad, rolls, and drinks. Also, a variety desserts will be available. Dinner preparations begin early, Lambert shared she and some of the other volunteers work all day Monday and Tuesday. “We do this because God loves us and we know that He loves everyone, that is why we should do this for his people,” said Lambert. “This brings a joy and we, anybody that works at this dinner, get the blessing,” said Lambert. The church does deliver carryout meals to shut-ins only, but those orders have to be in by Monday, Nov. 19. Call orders to 304-675-2170 during office hours from 9 a.m. to 1 p.m., Monday-Friday. Or, call 304-675-4883. For those planning to attend the annual dinner, use the church’s side entrance along 8th Street. The Presbyterian Church has a weekly food pantry, as well as clothes pantry, both are open every Wednesday from 10 a.m.- 2 p.m.
https://www.mydailyregister.com/wp-content/uploads/sites/24/2018/11/web1_1123.Diners.jpgHundreds of people come out each year to enjoy a homemade Thanksgiving meal at Point Pleasant Presbyterian Church.